Outdoor ads helping to address high levels of pollution in major cities can come across as gimmicks, so they need scale to make a true impact, ad agency executives have said. Two environmentally friendly outdoor executions went live in London this month. 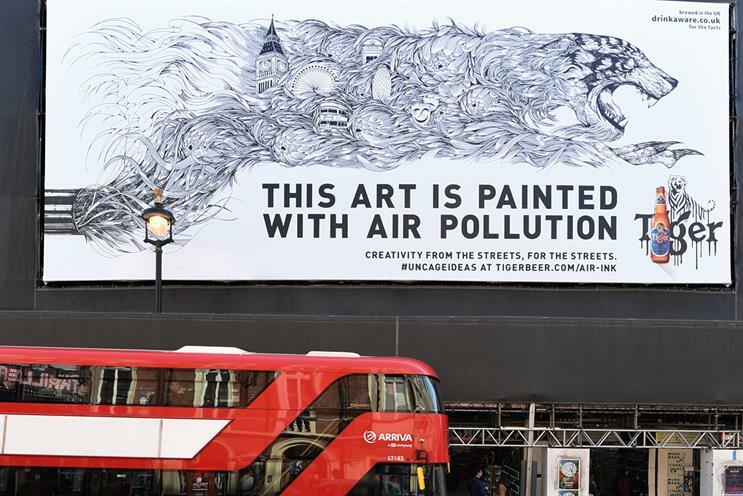 Heineken-owned beer brand Tiger and its agency Marcel Sydney teamed up with Anirudh Sharma, inventor of Air-Ink, to install an outdoor poster on Shaftesbury Avenue that was "painted" using air pollution. Meanwhile, Italian out-of-home company Urban Vision launched "air-cleaning" billboards in a campaign called "The breath" in Leicester Square and Shepherd’s Bush. They use nano-molecules to remove pollutants. While one uses pollution to shape creative and the other uses it to actively combat pollution, both brands are seeking to highlight a rising environmental issue. But are they meaningful or simply gimmicky? Leo Rayman, chief executive of Grey London, thinks all advertising should "contribute to culture, not denigrate it". He said: "I’d like to see them take it further, though. What’s the ultimate cultural ambition? How could outdoor advertising be really useful to the world, providing a lasting solution at scale to air pollution?" Rayman said the question about gimmickry is largely irrelevant: "These campaigns may be gimmicks, but they’re highlighting an important problem, stimulating conversation and providing a creative solution." For Sanjiv Mistry, EMEA creative director at McCann London, using the "medium as the message has a long, pedigreed history in advertising". He praised Tiger’s work for the way it draws "attention to a somewhat invisible problem". However, he added: "True impact can only come with wide scale. When multiple media owners begin using these technologies as a matter of course, that’s when they will make the leap from awareness-raisers to practical utilities." To avoid the accusation of gimmickry, longevity is crucial too, Mistry stressed, as these campaigns must not be rolled out only to be pulled after awards have been won. He lauded 2007’s Cannes Outdoor Grand Prix winner, BBDO’s "Power to the people" for Nedbank, which used solar panels on hoardings to power a school. Mistry said: "Long after the fame of Cannes had come and gone, the billboard kept generating the school’s power, and similar sites were rolled out across the country." Mie-Leng Wong, global director at Tiger, insisted advertisers must persevere in their pursuit of environmentally friendly marketing. The Tiger campaign will run in Berlin, New York and Singapore. She cited a Dutch artist who is using smog to create diamonds and Tiger’s move to repurpose old tiles, crates and woks to create "cool, bespoke in-bar materials". Wong said: "Showing that there are unexpected, creative ways of addressing major issues provides a powerful message of courage and hope." Tiger is enthusiastic about Air-Ink’s potential. "The great thing is its verstility," Wong added. "Hopefully, it will be developed into mainstream ink for printing all types of materials. The possibilities really are endless." Does Piccadilly's revamp signal a Blade Runner future?